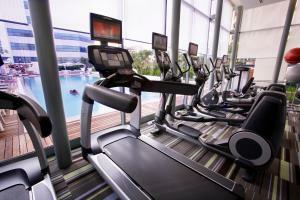 The size of the apartment, the white goods, the location, the amenities - the gym. 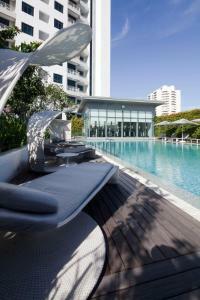 Very kids friendly atmosphere with a lot play area, nice pool, very quiet. convenient with food, supermarket and restaurant around. No pork in breakfast. Good location to travel to downtown. very beautiful neighborhood. Staffs are helpful and cordial. Pool and gym are clean and usable. Breakfast buffet is a good value. Property is conveniently located next to a shopping center and restaurants. Excellent clean appartment with all required amenities for family. I stayed with young kids in a 2 bed room appartment. Initially it was reserved in 7th floor. On our request they shifted on 15th floor appartment after 2 days . We would really think to come back in this serviced suites again. Food was was very good and the beds very comfortable special mention to the pillows very comfy we loved them ..and my kids really enjoyed the swimming pool and the Jungle area. Washing machine & dryer in the 3 bedrooms apartment that i stayed in. Good Location. Reasonable size accommodation for a family of 5 to stay together. Free WiFi. Good gym. Good sized swimming pool. The service was excellent. They were very accommodating and anticipated our needs. We came early but they let us check in ahead of time. The rooms were clean and they provided some of our requested items - crib, baby bath tub, high chair. 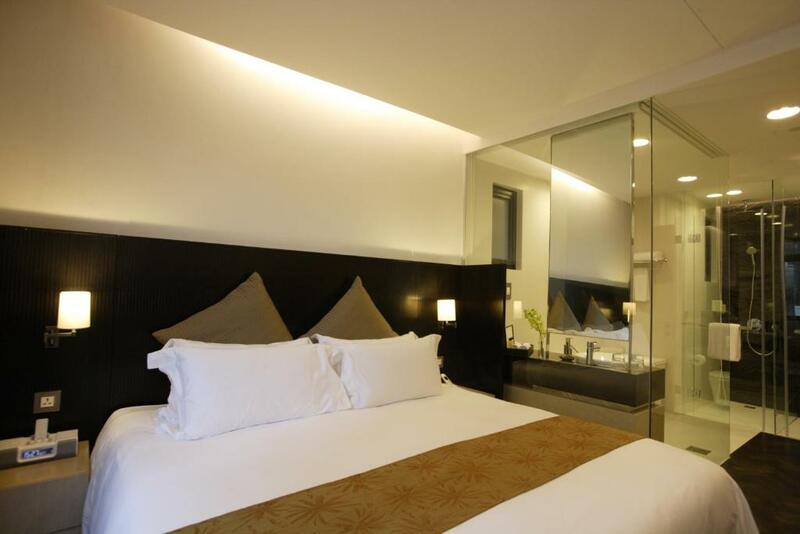 Lock in a great price for Fraser Suites Singapore – rated 8.8 by recent guests! Fraser Suites Singapore This rating is a reflection of how the property compares to the industry standard when it comes to price, facilities and services available. It's based on a self-evaluation by the property. Use this rating to help choose your stay! 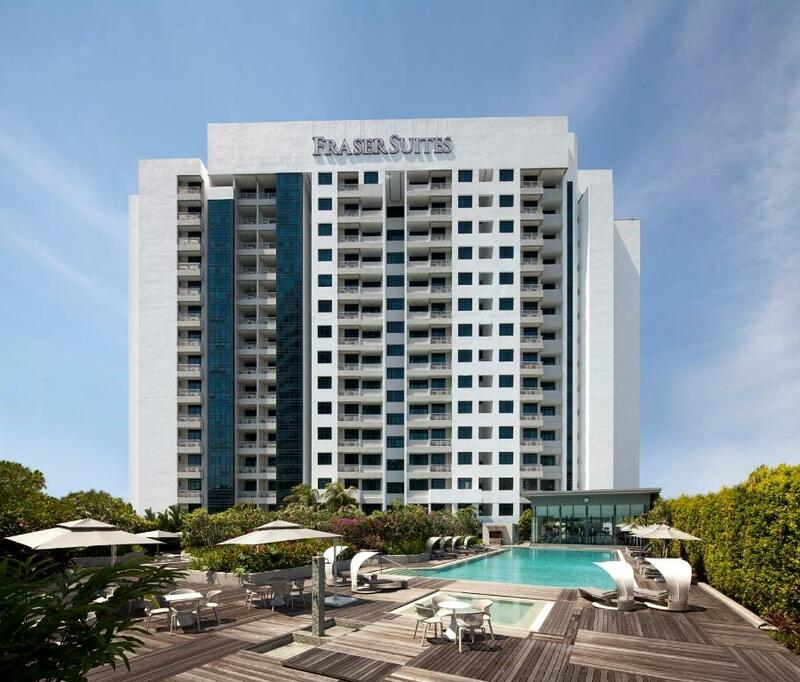 One of our top picks in Singapore.Located in an exclusive residential area, Fraser Suites Singapore provides a scheduled shuttle service to popular Orchard Road and Suntec City. Fully furnished apartments come with a kitchenette and free in-room WiFi. An outdoor pool is available. 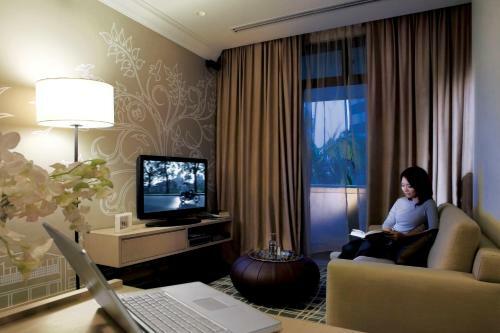 Featuring modern designs, all apartments include a flat-screen TV, iPod dock and DVD player. 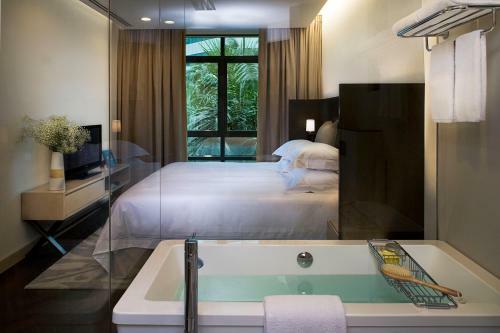 Master bedrooms have an private bathroom with bathtub, separate standing shower and free toiletries. A washing machine and clothes dryer are provided in the larger apartments. Just next to Valley Point Shopping Mall, Fraser Suites Singapore is a 15-minute walk from Tiong Bahru MRT Station and Tiong Bahru Plaza. It is a 30-minute drive from Changi International Airport. One free parking space is provided per apartment booked. 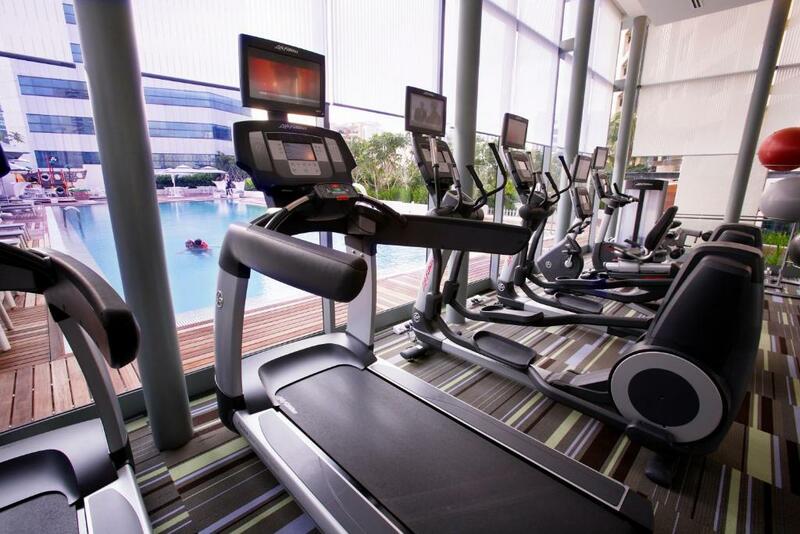 Guests can relax at the steam room and sauna, or exercise at the 24-hour fitness center. The Retreat features massage chairs and foot massage facilities. There are also barbecue facilities, a children's wading pool and a children's playroom. At The Dining Room, guests can enjoy à la carte breakfast, with the option of outdoor seating. Room service is available from 12:00 - 21:00, providing light snacks and finger foods. All-day dining serves no pork and no lard. 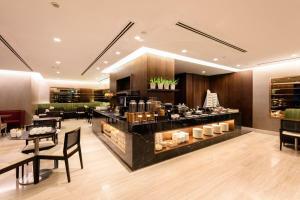 When would you like to stay at Fraser Suites Singapore? This fully furnished apartment comes with 3 bedrooms, a living room, a kitchenette and a balcony with city or pool views. Includes a flat-screen TV, DVD player, iPod dock and a washing machine. Private bathroom has a shower and free toiletries. Please note that room price is for 5 guests only, children of all ages included. Maximum occupancy is 6 guests, extra charges may apply (see Hotel Policies). This fully furnished apartment comes with a living room, a kitchen and a balcony with city or pool views. Includes a flat-screen TV, DVD player, iPod dock and a washing machine. Private bathroom has a shower and free toiletries. Please note that room price is for 2 guests only, children of all ages included. Maximum occupancy is 3 guests, extra charges may apply (see Hotel Policies). This fully furnished apartment comes with 2 bedrooms, a living room, a kitchen and a balcony with city or pool views. Includes a flat-screen TV, DVD player, iPod dock and a washing machine. Private bathroom has a shower and free toiletries. Please note that room price is for 4 guests only, children of all ages included. Maximum occupancy is 5 guests, extra charges may apply (see Hotel Policies). At the end of the day, retreat to the sophisticated and timeless appeal of our serviced residence. Designed for indulgence and rejuvenation, everything you need is right here - in your beautifully-appointed oasis of calm. Nestled in a prime residential district, Fraser Suites Singapore enjoys easy access to the affluent financial hub - Central Business District and Orchard Road, a world renowned shopping belt sporting numerous malls and boutique stores. The vibrant riverside corridor of Clarke Quay and Boat Quay - hosts of a myriad of themed restaurants, al fresco dining, chic pubs and specialty shops are also located close by. Staying at our coveted address paves the way for impeccable service and unmatched benefits, such as seamless access to a host of services and amenities. Find what you require within the serviced residence, at the adjoining shopping centre, an easy stroll or a convenient scheduled shuttle service away. Truly, staying in a Gold Standard serviced apartment is a peerless experience. 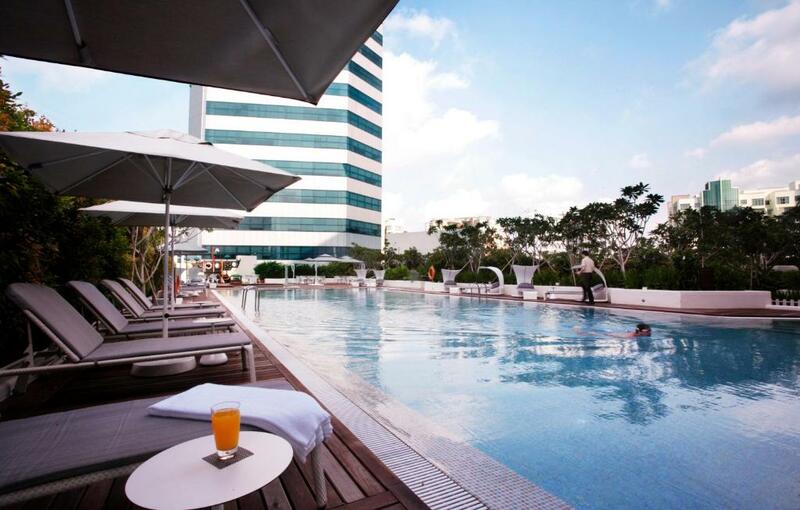 House Rules Fraser Suites Singapore takes special requests – add in the next step! One child from 6 to 11 years is charged SGD 27.50 per person per night when using existing beds. One older child or adult is charged SGD 55 per person per night when using existing beds. Fraser Suites Singapore accepts these cards and reserves the right to temporarily hold an amount prior to arrival. Please note that the guest checking in has to be at least 21 years of age. Please note that the credit card holder must be present at check-in. Otherwise, an alternate credit card will be required. A prepayment deposit of one night's room charge at least one day before the date of arrival is required to secure an early check-in. Pending the deposit, early check-ins and late check-outs will be subject to the apartment's availability. Charges apply. The bathroom set up in the master suite was strange. Our coffee machine didnt work properly from day one, second one didnt work either third one was perfect. The cleaner looking after our apartment went over and beyond to help us and our 12 mth old baby who was often asleep till 2-2.30pm making it hard for her to clean but she still did it for us. Also, first place I hve ever been to where the lifts are available straight away never ant long waiting times perfect and the pool and child play centre are fantastic. And the upgrade to a two bedroom with a baby worked out perfect for us also. Some facilities can be repaired or better maintained such as massage chair at public area. Shower in room. Mmmmmm, that we had to ask for toilet rolls and essential items e.g. shower gel, shampoo, tea and coffee. 1. We reported that the air conditioning ducts, both in the master bedroom and the front entrance were leaking on the first day we arrived at the apartment however they were still leaking on the final day of us checking out. washing machine works good, location close to center, local food nearby with walking distance, confortable bed, good breakfast value the money. Breakfast was slightly limited but still overall okay. Staff were great everyone was very polite and helpful. The building had great facilities such as the pool area and kids play room and outdoor area. Room was clean and tidy with everything we needed. Overall great experience.